A paradise on a sliver of land, Kerala easily justifies its ‘God’s Own Country’ nickname. From lush, verdant hills to serene backwaters and pristine beaches; this state on the western coast of South India is bounteously endowed by nature. What completes it as a holistic tourist destination is its rich abundant culture. It is no wonder that Kerala was named among the ten best destinations in the world by Lonely Planet in 2014, and was ranked eighth on the list of ’12 Destinations to Watch in 2017’ by The Association of British Travel Agents. Here are ten things to see and do in Kerala for an unforgettable experience. 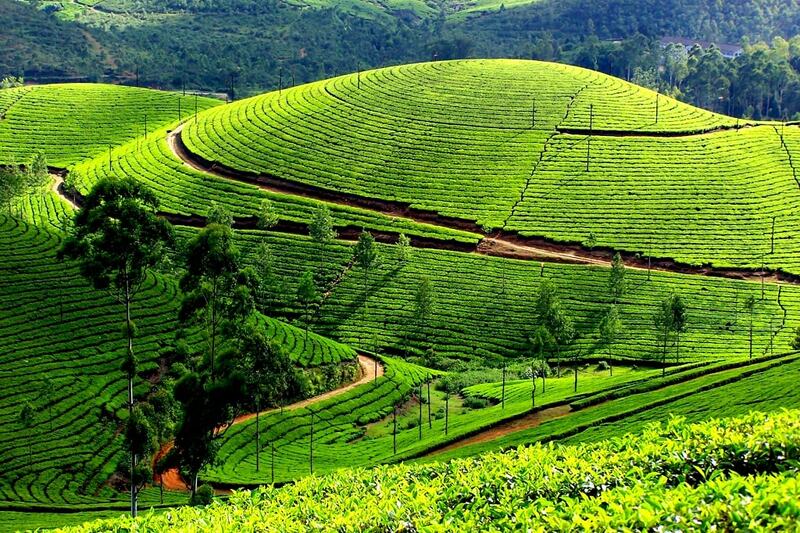 The coolest hill station in the state, get cosy amid the fragrant verdure of the tea estates. Learn all about tea – from plucking its leaves, identifying the different kinds of leaves and tasting various tea falvours, to watching the entire process at the Tea Museum, Nullatanni, Munnar. Don’t forget to take home fresh packets of a range of teas for everyone back home. Not just a family and romantic getaway, Munnar is also a hub for the adventurous as it offers several trekking trails and breathtaking spots for camping in the wild. This place is also a great attraction for its indigenous flower – Neelakurinji – a blue coloured wild flower that blooms once in 12 years. It is slated to bloom next in 2018 from August to October. Known for its famous hanging rock that balances between two larger blocks of rocks, Edakkal Caves, Nenmeni takes you back in time. Petroglyphs on the walls of these caves are estimated to be as old as 7000 years. Wayanad is also a haven for wildlife lovers who can visit Muthanga Wildlife Sanctuary where the Indian bison, tigers, deer, civet cats, langurs, wild dogs, and panthers can be spotted; not to mention casual encounters with wild elephants even on the roads. Go on a head-spinning drive along the nine steep hairpin bends at Thamarasseri Churam. Taste the rustic life through eco-tourism in authentic village homestays; or relax at luxurious resorts by the peaceful Kabini River. A mark of tradition that has withstood the passage of time since 1798, Thrissur Pooram is one of the grandest spectacles in Kerala. Held at Vadakkunnathan Temple, Thekkinkadu Maidanam during April-May in the district of Thrissur, it is the largest Hindu temple festival in the state. Paying homage to the presiding deity Shiva, the celebrations witness an exemplary array of majestically caparisoned elephants. 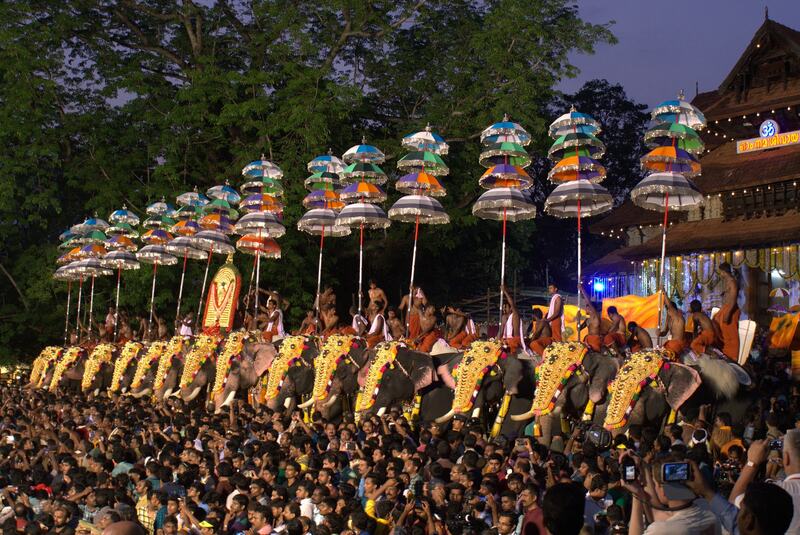 The highlight of the event is the Kudamaatam – the exchange of colourful umbrellas by the mahouts astride the lofty beasts. The visual treats are accompanied by the heady rhythms of the Panchavadyam – an orchestra of five instruments that play non-stop throughout the proceedings with varying tempos. The event witnesses one of the largest congregations of people not just from all parts of the state, but from across the country and beyond. No picture of Kerala is complete without its lavish lagoons. Known as the ‘Venice of the East’, Alappuzha is full of beautiful waterways and channels. Hire a houseboat and watch life pass by in slow motion while skimming over the waters. Experience the lifestyle of the local folks and learn the tricks of fishing. Savour the fresh catch, especially the ‘pearl spot’ fish, locally known as Karimeen, which is the prominent specialty dish from the region. Alappuzha is also famous for its annual Vallamkali – boat race, where snake boats carrying around a hundred oarsmen compete for the Jawaharlal Nehru Trophy. These beaked boats measure over 30.5 metres (100 feet) in length and are one of the iconic symbols of Kerala. Fort Kochi is a melting pot of cultures. Go on a historic trail by checking out the Jewish Synagogue, Jew Town, Mattancherry which is the oldest in the country and has Chinese handmade porcelain tiles that are over 250 years old. Marvel at the rich Kerala mural art adorning the walls of the Dutch Palace, Jew Town, Mattancherry. Visit the tomb of Vasco da Gama – the first Portuguese man to set foot in India – at the Church of St Francis, Fort Kochi, which is the oldest European church in the country, dating back to 1503. Continue on the ancient route by shopping for antiques and curios at Jew Town. End the day with a mesmerising sunset at the Fort Kochi Beach front, by the side of the Chinese fishing nets. The teeming cafes will leave you spoilt for choice to rest and refresh with snacks and meals. Unarguably the most famous symbol of Kerala – Kathakali is an art form that finds pride of place in UNESCO’s list of Intangible Cultural Heritage. Embodying perfection in every way – from its preparation to expression, this classical Indian dance from Kerala leaves the viewer enchanted. A discipline of its own, a dancer may take up to a decade to master the art form. Giving prominence to facial expressions, its makeup is also a painstaking process that takes three to four hours, being completed in various stages. Stories from the Indian epics such as Mahabharata and Ramayana are enacted in this form of dance drama. Theyyam is a form of worship, particular to North Kerala. It is characterised by the vibrant red hue that the artist adorns himself in from top to bottom. The dance is performed before the village shrine with elaborate rites and rituals. With a treasure trove estimated to approximately Rs 1 Lakh Crore or US$ 15.56 billion, the Padmanabhaswamy Temple in Thiruvananthapuram is the world’s wealthiest place of worship. Apart from its vaults overflowing with gold and diamonds, the temple is also rich in terms of its architecture, being built in the traditional Kerala style and dating back centuries. The leading deity that is worshipped is the idol of Lord Vishnu in a reclining posture of eternal Yogic sleep, referred to as Ananthashayanam. Thiruvananthapuram is also the place that preserves the vestiges of Kerala’s royal history, which can be seen through the several palaces such as Maharaja Swathi Thirunal Palace, Pazhavangadi, Kanakakunnu Palace, Nanthancodu, Koyikkal Palace, Nedumangad, among others. It is now a favourite haunt of nationalities from across the world. Varkala offers a combination of tranquil beaches and lively shacks and cafes to ensure a calm and laid-back time. It is the perfect place to unwind and live in the moment. Unique for its cliffs which afford magnificent views you’ll find ideal photo-ops during sunset. Laze around by the beautiful Kappil Lake Beach and explore Anjengo Fort, Anchuthengu that dates back to the Portuguese era of the 1690s. Those looking to channel their spiritual side can visit the famous temples and spiritual centres such as the 2,000 year old Janardhana Swami Temple and Sivagiri Mutt. Satiate your appetite at popular cafes such as ABBA Restaurant and Evergreen German Bakery, Cliff Top, Darjeeling Café, Middle Cliff, Trattorias, Black Beach, and Café Italiano, Oceano Cliff. A visit to Kerala is incomplete without partaking of its traditional feast – the Kerala sadya. Served in a plantain leaf, it is a complete meal that encompasses every course, right from the starters to dessert. It assimilates every flavour, taste, and texture – from crunchy banana chips, crispy pappadam, soft curries, stir fried vegetables, spicy rasam, colourful gravies, to sweet payasams. A complete, vegetarian meal, it is recognised as a healthy feast. An important component of all celebrations, the sadya is most common during the festivals of Onam and Vishu, and is served as the lunch banquet at Hindu weddings. The ultimate way to end a trip to Kerala is by indulging in an absolutely relaxing Ayurveda treatment. Choose from a range of oil massages and learn some of the meditation techniques and Yogasanas that can be practised and benefited from for life. Under expert and disciplined guidance, this 5,000 year old health care system can even be adopted as a way of life. While Ayurvedic practices have gained global acceptance, it would be foolish to miss out on a chance to experience it authentically in the land where it originated.